Living in New York feels like a constant battle for space, and this problem holds true right down to my kitchen counter. Whenever I cook, I like to spread out all of my ingredients, cookbook, pots and pans, so work space is essential. With that being said, I have found it necessary to be as strategic as possible in organzing my sink area. I realized that rather than having all of my essentials (like my sponges, gloves and paper towel rack) out on the counter, I could hang them on the wall! 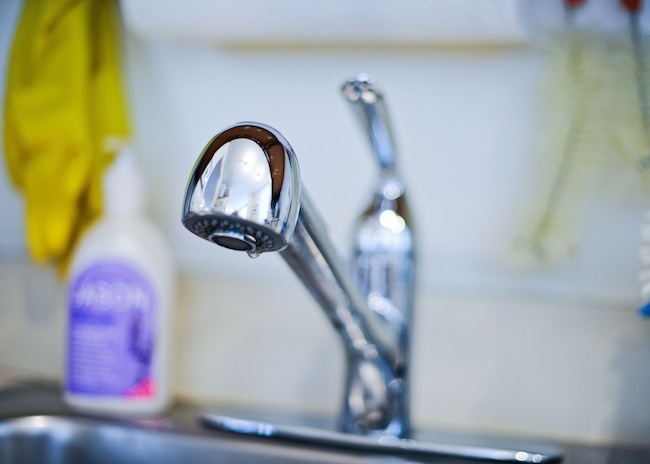 And rather than have a million different dish soaps and sanitizers, I really could narrow down to two essential products. So how did I do acheive this clean and sleek kicthen sink? 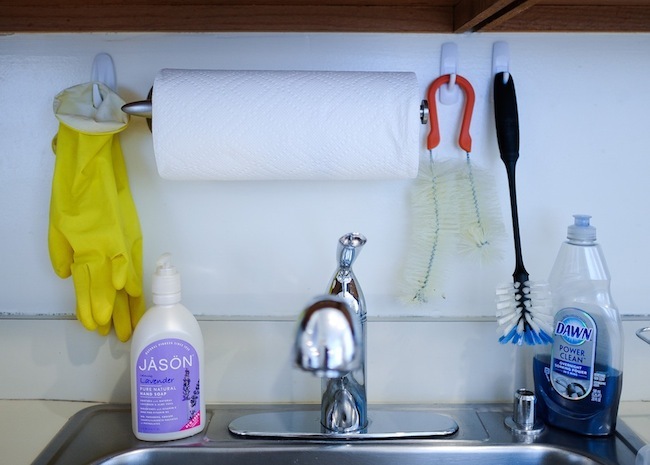 Invest in a Hanging Paper Towel Rack [I bought the Umbra Stream Metal Wall-Mount Paper Towel Holder] It is sleek and narrow and it’s easy to slip on a new role. 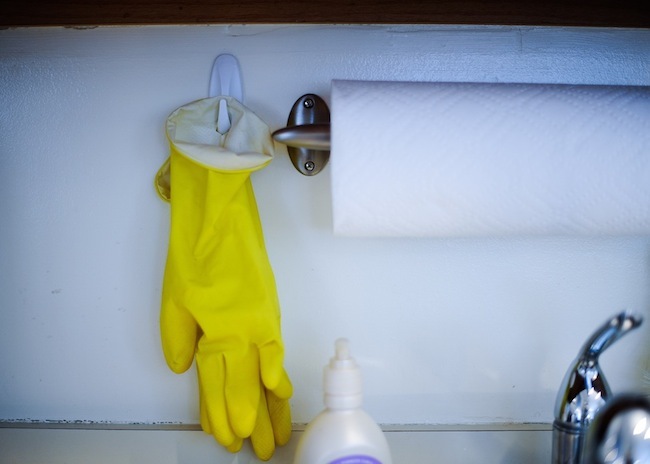 Use Adhesive Hooks to hang sponges and gloves. 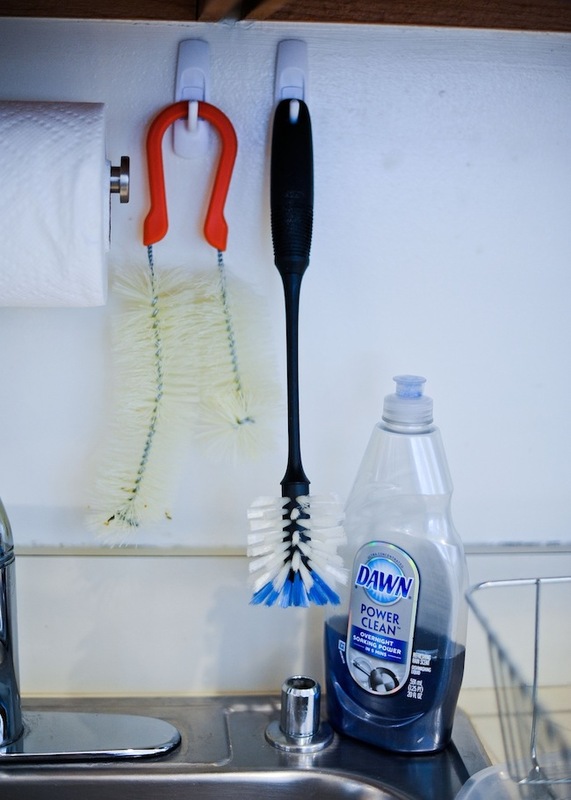 [I bought Command Adhesive Hooks] They blend into a white wall and they are easy to apply. *Note #1: I actually cut a small hole in the top of my glove set so that they would hang on my hooks. 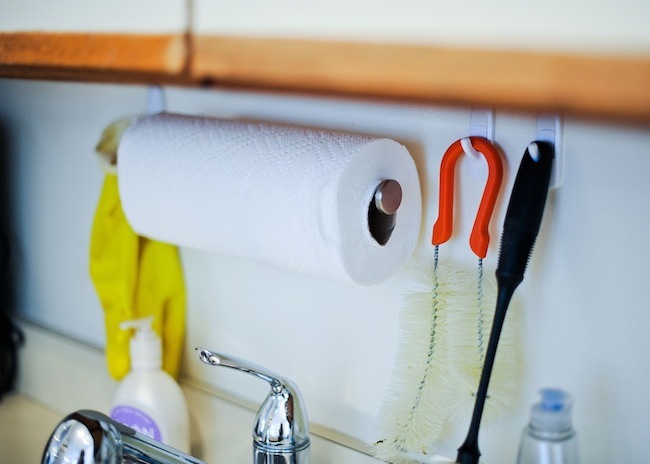 *Note # 2: Make sure your utensils are hanging friendly before you hang a few hooks and then realize you have nothing to hang on them! Narrow down your essential products! You really need a great hand soap [I love JASON Calming Lavendar Hand Soap] It has Vitamin E and Pro-Vitamin B5, which softens your hands while cleansing, and then you need a powerful dish soap [I use Dawn Power Clean Dishwashing Liquid] Don’t get caught wasting money on a cheap non-name brand dish soap or some fancy-nice-smelling- frou frou soap because you will spend your life scrubbing. This soap gets down to business.